Securing the right method of disposal and recycling treatments for each of these waste types is of vital importance. At Powerday, we’re committed not only to avoiding sending waste to landfill, but also to the creation of RDFs (Refuse Derived Fuels) for use in the energy markets in Europe and at home, creating a more sustainable future where all waste can be recycled. We also adhere to all Environment Agency procedures, producing consignment notices for hazardous wastes. Uneaten, discarded or lost food counts as organic food waste. As a species, we waste food at both the production and consumption stage. Every year in the UK we produce millions of tonnes of food waste, with a cost reaching into the billions. Every household, along with many businesses contributes to this waste. What type of items are included? Organic food waste can be made up of all manner of food types. There will always be some organic waste, as some items are inevitably not going to be eaten, this includes things like egg shells, banana peels and other skins. In addition to household food waste, the hospitality industry also produces plenty of waste from food which is not sold, leftovers on plates and even food sent back to the kitchen. How is it dealt with? There are a number of techniques deployed to help avoid food waste ending up in landfill sites - where it would normally produce greenhouse gases as it decomposes. One of the best ways to utilise organic waste is through anaerobic digestion. This process breaks down the material which is deprived of oxygen, this then creates a biogas which can be burnt to provide energy. The leftover material from this is called ‘digestate’ and this can be used as a fertiliser or soil conditioner, increasing the amount of energy recovered. Households which do not receive a municipal food waste collection service can utilise their food waste in a composter, biodegrading the material and using it on their property. It has also been proposed by some that food waste could be given as animal feed, reducing wastage. Paper recycling has almost become second nature for many of us, with old and unused paper going towards the creation of new products, reducing the need for virgin materials to be sourced. You might not realise just how much paper we use in our everyday lives, items such as magazines, packaging, newspapers and even your gift wrap paper can all be recycled. As much as companies are going digital to reduce paper waste, it still exists, with most homes receiving a municipal collection for card and paper waste. 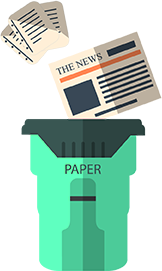 When waste paper is collected, it is processed for recycling in the initial stages using water and chemicals to break the material down. Further processing involves heating and chopping the waste until it becomes a pulp. De-inking is performed to remove colouring, along with straining to remove glues and plastics. This recycled material can then be used to create new paper products. There is some debate about just how much impact this recycling process has, but it is generally agreed that energy as well as resources are saved through these recycling efforts. Plastic pollution is high within modern society, so it’s unsurprising that we’ve been increasing recycling for plastic and increasing the use of recycled materials in everyday products. Recycling plastics can be challenging due to the range of resin categories involved. Plastics can be found in lots of everyday items, all using different polymers. These different items are just a few examples, with each polymer having a different identification code. 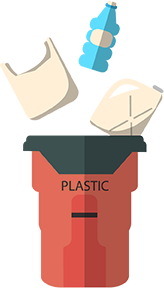 Plastics are sorted automatically by resin type to help with the process of recycling. The materials are then shredded - sometimes having been organised by colour - and put through a process which helps to rid the plastic of any impurities or non-recyclable elements. The purer plastic materials are then melted and chipped into pellets which can then be used to manufacture future plastic products. Greater efforts have been made recently to encourage people to help increase plastic recycling rates in the UK. There are other techniques of recycling being developed, but the above is the style currently employed in the UK. Due to its weight and density, recycling glass helps greatly in the effort to reduce the volume of waste going to landfill sites. Glass has been recyclable for some time, but it is now recycled on a massive scale with municipal collections and facilities for glass. The most common item made from glass is drink bottles, including everything from wine and beer bottles to fizzy drinks and coffees bottles. The other items which make up the most commonly recycled glass items includes jars, bulbs and broken glassware. The different colours of glass are usually separated as it keeps the colour even after being recycled. The most common colours include clear, green and brown glass. Using less energy than it takes to create new glass items from raw materials, recycling glass is done quite easily. Firstly, the glass is sorted by machine and rinsed to get rid of as many contaminants as possible, then it is crushed and melted to be reused in manufacturing. Bottles and jars can be created from the crushed and melted materials, but it can also be used in construction in the manufacturing of astroturfs and fiberglass. Metal is different to other materials insofar as it isn’t always classed as waste - it is sometimes referred to as scrap. There are two categories of metals indicated by the industry: ferrous and non-ferrous. Metal can come from a number of places, with the automobile industry contributing some of the largest quantities of scrap metal. In addition to cars, scrap metal can come from construction projects, office clearances and even civic amenity sites. The most common metals recycled are steel, iron, aluminium, copper and zinc. Non-ferrous metals tend to include metals with a higher market value, including gold, silver and platinum. In terms of general household metal waste, the most common items to be recycled are food tins and drink cans. Scrap metal which is no longer of any use is usually sold by weight for the metal ore. The metal is then smelted and can be used again to avoid the use of virgin ores. Small, everyday metal items like tin cans, along with the bulk metal waste from commercial sources, is sorted and then processed to also be reduced and reused again in manufacturing new products. The recycling levels of textiles has been slowly increasing for quite some time, helping to avoid textiles entering landfill sites. Wet or heavily soiled items, however, can still end up in landfill where processors cannot handle them. When we think of textiles, we typically think about clothing, but while clothing does represent a very significant portion of textiles waste, there are other sources of this waste type you might not have considered, including carpets and furniture. 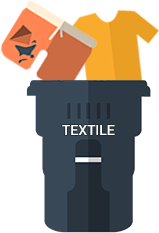 There are a number of textile categories for recycling, with cotton, wool, polyester and nylon just a few of the biggest. Clothing banks have long been around, as have the clothing collections performed by charities across the country. These clothes can be recycled by putting them back into use if they are of an acceptable standard. Those clothes which are not reusable are sent for processing. The waste textile materials - where they are not soiled or wet - can be categorised before processing and sorted by colour. Standard cotton materials can be milled, cleaned and spun for the production of new weaving or knitting materials. Textile fibers can also be used for making a number of other materials, including mattresses, insulation and furniture lining. Polyester materials can be recycled separately, shredding the material down and granulating it before melting the chips down to make new polyester textiles. Hazardous waste is subject to a number of regulations in order to protect the environment and the public from the harmful substances. Sometimes referred to as COSHH waste, anyone coming into contact with such waste should do so only with extreme caution. Hazardous waste is defined as anything which is toxic, ignitable, reactive or corrosive. The hazardous waste created by households and commercial entities differ, but they must all be dealt with in the same way: using a great deal of caution. Previous attempts to dispose of hazardous waste in normal landfill sites led to disastrous environmental consequences. Without proper treatment, there is a huge risk of contaminating land, with battery acid and other chemicals seeping into natural water systems. Fortunately, most hazardous wastes are now be recycled and used to make new products. The Environment Agency oversees that the collection and disposal of hazardous waste is done so properly and with the requisite paperwork to indicate records of the waste in England. Through our commercial waste collection services and dedicated, professional teams, you receive the highest standard of service, with the peace of mind knowing that your waste is in the best hands. Get in touch today to discuss your waste stream and the possibility of recycling services from Powerday.